Alesksey Navalny was this morning unexpectedly released from custody, but he will be back in prison within a few weeks, says Grigorii Golosov. How has the opposition leader managed to become so well-known — and so dangerous for the Kremlin — in such a short space of time? On 18 July, the Lenin District Court in the city of Kirov sentenced opposition activist Aleksey Navalny to five years in a prison camp for alleged embezzlement of funds at the Kirovles Timber Enterprise. I will not go into the details of the case against him and co-defendant Petr Ofitserov. Suffice to say that in the opinion of the former Finance Minister Aleksey Kudrin, whose competence in the legal regulation of economic activity in Russia should not in doubt, ‘Navalny’s sentence shows up our selective system of justice: any official involved in the management of a company could be given the same sentence.’ In Kudrin’s view, his sentence is a way of ‘isolating a politician from public life and the electoral process’, and the majority of Russia’s legal experts agree with him. The question ‘why is Navalny going to prison?’ has very little to do with Kirovles, and a great deal more with Russian politics. So the question ‘why is Navalny going to prison?’ has very little to do with Kirovles, and a great deal more with Russian politics. And to answer the question, one has to understand how it is that Navalny has managed to become so well-known and popular in such a short time, and an opposition politician who is so dangerous for the authorities. For this is why is being sent to prison. The Western press sometimes expresses the opinion that Navalny is a civil activist fighting corruption, with no political aims, and that he is very inconvenient for the authorities because of the information he has revealed. This is largely incorrect. Politics have long since become Navalny’s profession. He was born into the new middle class (his parents own a small firm in the Moscow region), and he received a good legal and financial education. When he was 24 he had a go at business, but not very successfully. In his own words, this meant he lost the little money he actually had. In 2000, at the age of 24, Navalny joined the ‘Yabloko’ party, which is Russia’s oldest liberal party, and advocates liberal democracy and a market economy. The ‘Yabloko’ position was somewhat more left-wing than the other liberal party of the time, ‘Union of Right Forces’. It is, however, very likely that Navalny’s choice was dictated by the rather more open structure of ‘Yabloko’ and the opportunities it offered, than by ideology. In one way or another, Navalny rose rapidly through the ranks of the party: by 2002 he had already joined the leadership of its biggest Moscow branch and in 2003 he managed the Moscow electoral campaign in the nationwide parliamentary election; by 2006-7 he was a member of the highest party body, the Federal Council. ‘Yabloko’s’ political position was weaker after the 2003 election. It was no longer a parliamentary party, which to a large extent wrecked its organisational opportunities. The regional structure started to collapse and these changes led Navalny to look for opportunities elsewhere. In 2004 he founded, and was one of the leaders of, the ‘Committee for the defence of Muscovites’, a city movement against corruption and human rights violations in construction in the city. In 2005 he was one of the founders of the youth organisation ‘Democratic Alternative.’ During this time he was still one of the leaders at ‘Yabloko’; his final break with the party came in 2007, though not of his own volition. After the 2007 parliamentary election, which ended in a total rout of the democratic forces, there was an idea current in liberal circles that supporters of democracy would be able to regain their popularity if they added a dash of nationalism to their political mix. The first attempt in this direction was a pressure group called the ‘Nationalist Russian Liberation Movement’ whose Russian acronym (NAROD) spelt the word ‘People’. Navalny was one of the founders and signed the manifesto, which was in effect all the movement ever amounted to. But for him this project had significant consequences, both short- and long-term. Firstly, other ‘Yabloko’ leaders found Navalny’s new ideological initiative unacceptable, and in December 2007 he was expelled from the party. Secondly, his episodic involvement with NAROD had given him quite a reputation in Russian nationalist circles. He subsequently kept in touch with the nationalists, taking regular part in their annual events — the so-called ‘Russian marches‘ — as one of the organisers. But Navalny’s ‘nationalism’, which was later used against him by his opponents, was always fairly dubious and was not much more than a stance on individual issues, such as illegal migration and inter-budgetary relations, which found a response in the public. His public addresses contain little that could be described as a nationalist agenda and his activities during the period 2007-11 had nothing to do with nationalism. In a year and a half Navalny’s RosPil’ exposed and classified 1.6 billion roubles’ worth of fraudulent procurement contracts. After being expelled from ‘Yabloko’, Navalny turned his attention to the protection of people’s rights in the economic sphere. In 2008 he set up the NGO ‘Union of Minority Shareholders’, which concerned itself with defending the interests of private investors. But his greatest claim to fame was the project ‘RosPil’ [a play on words: raspil is a Russian word for a carve-up], set up in December 2010 and aimed at fighting abuses in public procurement. On 2 May 2011 ‘RosPil’, had exposed and classified a multiplicity of fraudulent tenders amounting to 1.6 billion roubles’ worth of contracts. Navalny set up a blog on LiveJournal to publicise the activities of RosPil, and in a short time this blog had become fantastically popular. It was because of the blog that Navalny became so well-known and started being regarded as an influential figure among politicised circles of internet users. The media then started publicising the blog. Then, in February 2011 Navalny took to the waves of ‘Finam FM’ radio station to dismiss the bedrock of Putin’s political support, the ‘United Russia’ party, as a ‘party of crooks and thieves’. Met with an indignant response from a ‘United Russia’ supporter, Navalny kept up the pressure by asking readers of his blog: ‘Is United Russia a party of crooks and thieves?’. During the course of the survey and the accompanying debate, the phrase ‘party of crooks and thieves’ became an internet-meme and a regular entry in Google and Yandex search engines. To a large extent because of this, by 2011 Navalny had become considerably better known, though even then his popularity remained within the confines of politically literate online Russia. The Russian opposition went into the 2011 parliamentary election with fairly low expectations. It was clear in advance that the repressive legislation on parties and elections, combined with the authorities’ complete monopoly of TV and print media, would result in a ‘United Russia’ victory. Most of the opposition called on democratically-minded voters to boycott the election. Navalny managed to put forward an alternative strategy, which looked fresh and optimistic in the context of the general pessimism. He suggested turning out and voting for any party except the party of ‘crooks and thieves’. This took him out of the narrow circle of internet users and made him fairly widely known. The success of his strategy only increased his popularity: despite all the expectations, ‘United Russia’ received less than 50% of the vote and many observers considered it had lost the election. The 2011 election also gave rise to a movement protesting against vote rigging, born to all intents and purposes on 5 December at the Moscow post-election demonstration. Navalny addressed the rally and was arrested, then held for 15 days, which made him even better-known. At the biggest demonstration on 24 December, Navalny appeared as the recognised leader of the protest movement. When the protest movement was on its way up, he found his earlier connection with the nationalists very useful, because they formed a vociferous, if not very numerous, part of the movement. Their involvement was Navalny’s doing and they provided him with a stable and relatively disciplined support group at a time when he had no organisational base of his own. Navalny had intuition. During the critical events of autumn 2011 and spring 2012, he made not one mistake. During the period of the protest movement many of its members regarded Navalny as their leader. On 4 April 2013 Navalny responded to their expectations by saying that he would like in the future to become the President of Russia. He played a crucial part in the informal coordination groups organising demonstrations. Opinion polls showed that his recognition by the general public was on the increase. He also had obvious political talent. As a blogger he had demonstrated that he could talk to any section of the public – even the most complex, the politicised internet users – in a language which could both interest and enthuse. This was confirmed at rallies, when Navalny’s speeches frequently became the central event. On top of this, Navalny had showed that as a protest organiser he could achieve compromises between the the most varied, often politically incompatible, groups - a rare, and therefore very valuable, quality in the Russian opposition. And finally, he had intuition. This is a quality which is crucial for a politician. During the critical events of autumn 2011 and spring 2012, he made not one mistake. It hardly needs saying that Navalny’s transformation into a recognised opposition leader was a matter of considerable anxiety for the authorities. On 31 July 2012 he was accused of criminal offences, which ultimately led to the 2013 conviction. Being under investigation was very inconvenient for political activities, if only because it limited his freedom of movement and many other opportunities. But the most important factor in Navalny’s trajectory thereafter was the gradual fading away of the protest movement, which became apparent in the summer of 2012. It became increasingly difficult to get people to turn out for demonstrations; other forms of protest were ruled out by existing political limitations. The main opposition event of the autumn of 2012 were the internet elections to the Coordinating Council of the Opposition, a body not noted for any particular organisational activity after it was elected. In this election Navalny received the majority vote, one more confirmation of his position as leader. But the overall effect of the election was remarkably modest. Navalny supporters set up a party around him, ‘The People’s Alliance’, though he himself did not become a member, obviously not wishing to sacrifice his position as a leader above party politics for an organisation with an uncertain future. During the spring of 2013 Navalny did little, and what he did was mainly linked with internet projects – RosPil and several others set up in 2012. However, the well-known inertia of public opinion ensured that his popularity continued to grow, as could be seen from opinion polls. An important contributory factor was the continuing dissatisfaction with the authorities among the wider public, whose favourable attention was therefore turned on to the best-known opposition figure. This enforced pause was interrupted by the campaign for the Moscow mayoral election, which was announced in June 2013, after Mayor Sergei Sobyanin unexpectedly announced his retirement. Explaining his decision, Sobyanin (who was appointed in 2010) said that he wished to obtain a direct mandate from Muscovites so as to be able to pursue his own policies. While enjoying Vladimir Putin’s full support, Sobyanin is also trying to present himself as an experienced manager, above party politics, so he refused to stand as a ‘United Russia’ candidate and will stand as an independent. His aim is obviously to increase his legitimacy, so his rhetoric from the very start has included the idea that this election will be fair and truly competitive. Navalny’s candidature will be annulled immediately after his appeal has been considered. There’s no question but that the appeal will be turned down. The authorities only intended to neutralise accusations levelled at Sobyanin that he went into the election with no real opponents. Navalny’s candidature fitted well with this concept of an election. He was put forward by one of the liberal parties, the ‘Republican Party of Russia – Party of National Freedom.’ This party has few organisational resources and Navalny still has no structure of his own. One of the conditions for taking part in elections of this kind in Russia is the collection of signatures of municipal deputies. They support ‘United Russia’ en masse, which could have presented an insurmountable barrier to Navalny’s participation in the election. But Sobyanin moved to enable Navalny to collect the essential number of signatures, and he was registered as a candidate. This happened just before the Kirovles sentence was handed down. The authorities’ reasoning in this can only be guessed at, but I think that from the beginning Sobyanin did not really intend Navalny to stand in the election. The fact that he would be found guilty was never in doubt, and under Russian law Navalny’s candidature will be annulled immediately after his appeal has been considered in the Kirov court. There’s no question but that the appeal will be turned down. The authorities only intended to neutralise accusations levelled at Sobyanin that he went into the election with no real opponents. One of the rhetorical tricks of the Russian authorities, as we saw in the case of Mikhail Khodorkovsky, is that they are not responsible for the decisions of the courts they control, even if the political reasons for these decisions are abundantly clear. Having sentenced Navalny to five years in prison, the district court at the same time instructed that he be held in custody until the sentence comes into effect i.e. until the appeal has been heard. This decision actually made Navalny ineligible to stand in the election, although formally he was still a mayoral candidate. This was probably the authorities’ main idea, relying on the fact that Navalny has already played his last card and it’s time to get back to business as usual. But, despite it being the ‘dead season’, the court decision provoked furious reactions in the public. There were fairly large protests in Moscow and Petersburg but, more importantly, some of the independent media universally described the effective removal of Navalny (his office, naturally, announced that he would not take further part in the election) as making a farce of the electoral campaign. Not at all what the authorities planned. 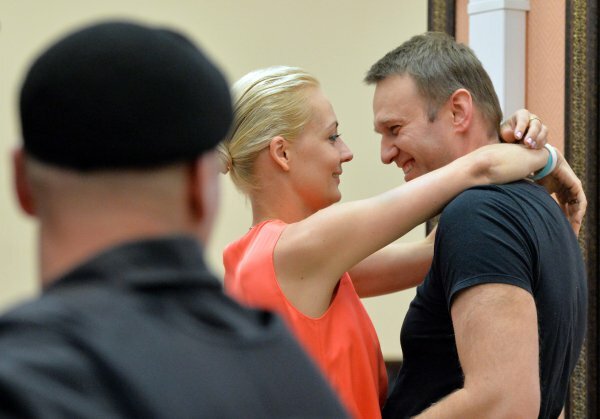 As a result, the court decision to hold Navalny in custody was protested by the prosecution and the next day, 19 July, was overturned by the regional court. We must stress that this small change to government strategy will on the whole work in its favour. Sobyanin will be able to run his campaign against an opponent, who actually still can’t take part in the election. It is highly probable that the sentence will be upheld a few days before the election, which disorientates the opposition and leaves no time to develop an alternative strategy. Meaning that Sobyanin will win the election and Navalny will find himself in prison. The only ways of dealing with this turn of events, which is by far the most natural for current Russian reality, would be if Navalny’s campaign was so energetic that without him the election risks being wrecked. I am not sure that Navalny has enough organisational or other resources to run such a campaign, but it is clear that wide-ranging energetic public support will be of critical importance, as will be appropriate behaviour on the part of the various parts of the Russian opposition. The fact of the matter is that Navalny is the most promising leader. The situation around the Moscow election has once more – and justifiably – put him at the front of the political stage. Now he must not let himself give in to gloom, but try to make use of this opportunity. A lot depends on Navalny himself. Possibly, the authorities have calculated that he now he will simply leave Russia.